More than 10 million people are under official warning as Hurricane Florence approaches the US, with hurricane-force winds are predicted to hit coastal areas as early as Thursday evening. The latest track of the storm suggests that it will strike close to the North Carolina-South Carolina border before heading further inland. As of 5 a.m. Thursday, the storm was 205 miles from the North Carolina shore. The hurricane is predicted to bring up to 40 inches of rain and 13 feet of storm surge, levels deemed "catastrophic" by forecasters at the National Hurricane Center (NHC). 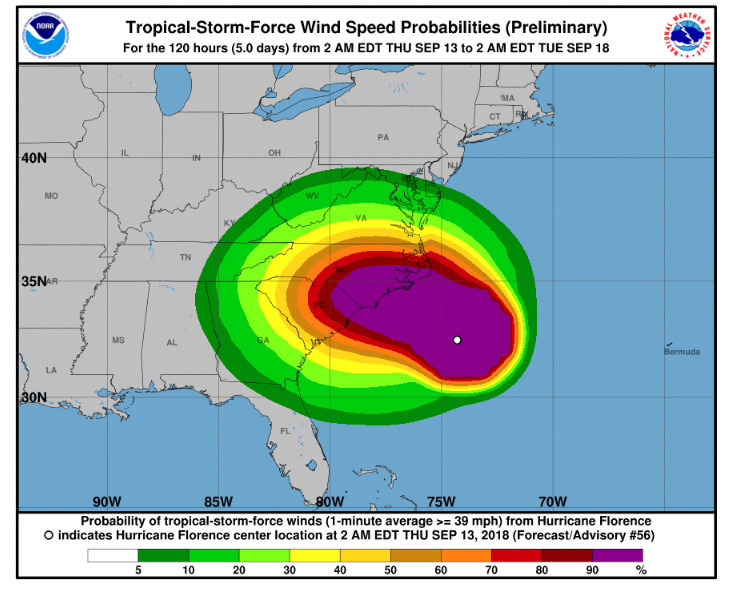 Hurricane Florence's wind speeds had slowed to 110mph as of 5 a.m. EDT on Wednesday, making Florence a Category-2 hurricane. The National Weather Service warned that the storm is no less dangerous for this dip in intensity, as most of the danger will come from the rain and floods. The storm is increasing in size, and the dangerous levels of rainfall and storm surge predicted have not changed, the National Weather Service warned. Together, this means that 10.15 million people are under some kind of extreme weather warning. A Hurricane Warning means that hurricane conditions are expected somewhere within the area within the next 12 to 24 hours. A Hurricane Watch means that hurricane conditions are possible within the watch area, and a watch typically issued 48 hours before the anticipated first occurrence of tropical-storm-force winds. The storm is predicted to slow down considerably as it reaches the coast, coming close to a standstill and dumping huge amounts of rain alongside a powerful storm surge — sea water forced inland by the hurricane's winds. The hurricane's predicted path has moved southwards and could bring dangerous conditions to Georgia, where Governor Nathan Deal has declared a state of emergency. Georgia joins North Carolina, South Carolina and Virginia, which were already working on emergency plans. Florence's storm surge — seawater forced inland by the power of the storm — could prove "life-threatening" and lead to "catastrophic" flash flooding far inland, the NHC warned. The below animation, shared by the meteorologist Jeff Ranieri, shows the danger posed by storm surge. In this simulation, 12 feet of extra water is enough to almost submerge a house. The National Weather Service branch in Wilmington, North Carolina, said on Tuesday that Hurricane Florence was likely to be "the storm of a lifetime" for the area. The hurricane is expected to produce "heavy and excessive rainfall," according to the NHC, which could lead to "significant" river flooding even far from coastal areas. The GIF below visualizes a possible trajectory for the hurricane, based on satellite data. The darker colors identify more intense parts of the storm. Hurricane Florence is 205 miles from North Carolina as of 5 a.m. EDT on Thursday. It's expected to bring "catastrophic" rainfall and "life-threatening" storm surge, with hurricane winds due this evening. The Federal Emergency Management Agency has urged anyone living in an evacuation zone to leave the area immediately. Jeff Byard, the associate administrator for FEMA's Office of Response and Recovery, said on Wednesday morning: "We cannot repair loss of life. The time to evacuate is now." "This is not going to be a tropical storm," he said, adding, "this is going to be a Mike Tyson punch to the Carolina coast." Winds in US coastal areas are expected to reach tropical-storm strength on Thursday, with the NHC urging that "preparations to protect life and property should be rushed to completion." The map below shows the probable path of strong winds from Thursday to Tuesday, according to the latest forecast. Mandatory evacuation orders are in place in coastal areas of North Carolina, South Carolina, and Virginia. The map below shows the probable path of the storm's center over the next few days. "Hazardous conditions," such as heavy wind, rainfall, and floods, can take place outside the zone identified on the map, the hurricane center said. Hurricane Florence "could be the most dangerous storm in the history of the Carolinas," FEMA's administrator, Brock Long, warned on Tuesday afternoon. About 1.7 million people have been ordered to evacuate their homes. Millions of others have been stockpiling supplies such as gas cans, generators, plywood, and sand bags, according to the Associated Press. In a video posted online Wednesday, President Donald Trump urged people to evacuate if they were urged to do so by local officials. "Get out of its way," he said. "Don't play games with it. It's a big one. Maybe as big as they've seen. Tremendous amounts of water." He added: "The storm will come, it will go. We want everybody to be safe." Two other storms, Isaac and Helene, are also spinning in the Atlantic Ocean.